Priced: $84.95 - $150.00 Rated: - 4 stars out of 5 by 9 reviews. • Weight: 16 oz/454 g.
• Type: Insulated, Snow Boots, Waterproof. • Fit Tip: We find this style runs about a 1/2 size small. • Lining: Moisture wicking textile. 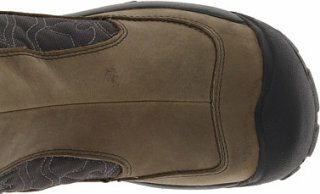 • Upper: Abrasion resistant textile, Waterproof nubuck. • Rubber: Non-marking rubber outsole. *Measurement Note: Our measurements were taken using a Women’s size 7 US (37.5 EU). Measurements may vary by size. • KEEN.DRY waterproof breathable membrane. • A proprietary waterproof, breathable membrane that lets vapor out without letting water in. • A lightweight insulation that keeps you warm. Who knew charcoal bamboo could create something that keeps your feet warm? But it makes KEEN.WARM - a lightweight, anti microbial insulation that provides warmth where you need it most. • Can a sandal protect your toes? The answer is yes. The reason is KEEN Patented Toe Protection where the shoe outsoles wrap up and over the toes for ultimate protection. 200g KEEN.Warm is a lightweight, antimicrobial insulation that provides warmth against the cold elements. Keen.PROTECT is where the shoe outsoles wrap up and over the toes for ultimate protection. Faux shearling lining for all day comfort and warmth. KEEN.DRY waterproof breathable membrane to keep your feet dry. Boot-boot-be-doop! Keen's Betty Boot winter boots know how to keep feet warm and dry; the secret is a combination of Keen Dry waterproof breathable membrane and Keen Warm insulation. S3 technology supports feet on impact, absorbs shock and reduces the odds of twisting your ankles. Kill the chill this winter with the Betty Boot II from Keen Footwear. A double whammy of Keen technologies (KEEN.Dry and KEEN.Warm) keep your feet warm and dry all winter long. And the Betty Boot II isn't just about performance; it looks great too and pairs wonderfully with your favorite winter dress and tights for a unique look that's all you. The Betty Boot II is an essential winter boot that will keep you warm and ready for any snow fight! for all day comfort and warmth. 200g KEEN.Warm™ is a lightweight, antimicrobial insulation that provides warmth against the cold elements. KEEN.DRY™ waterproof breathable membrane to keep your feet dry. Keen.PROTECT™ is where the shoe outsoles wrap up and over the toes for ultimate protection. These boots have women-specific style that stands out when lounging around the lodge, but are made with technical toughness that belies their striking exterior. The leather and synthetic textile uppers are adorned with rich, complementary highlights for an uninhibited look. Enhanced with 200-gram Keen.Warm™ insulation so your feet stay toasty warm in frigid weather. The Keen.Dry™ waterproof, breathable membranes rebuff moisture, while allowing perspiration to evaporate. The S3 heel support structure lends support at impact, dissipating shock, cushioning the foot and supporting the ankles. The nonmarking carbon-rubber outsoles provide increased traction and grip with their modern tread design. Imported. Women’s sizes: 6-10. Half sizes to 10. Lovin' these boots! I first ordered the Columbia boots with Omni-Heat as I'm a big fan of the warmth that Omni-Heat offers. The Columbia's didn't fit well at all so I was forced to look at something else. I was skeptical of the "Keen Warmth" liner, but these have done a great job keeping my feet warm. We've had several days lately with highs in the negative digits and my toes have stayed toasty. They are also stylish enough that I can wear them to work (biz casual) with my pants over them or tucked into them. I also like the zipper for easy on/off. At first I thought the zipper would make it look like a moon boot, but I haven't found that to be true. I own many pairs of Keens because of their comfort and these have upheld that standard. Also - I do use my own orthotic inserts, and with these boots, you can remove the Keen insert and use your own. I love these boots -- and I love Zappos! These are true to size, a little stiff at first but okay by day2. The heel cups and arch fit my feet very well. I need a wide toe box and Keen always delivers there. I wear a 9.5 but I ordered a 10 first, trying to allow for thick socks. They fit, but my heel slid forward and I could tell it wasn't sitting right in the foot bed. I went online and had the 9.5 the very next day with the Zappos lightning fast exchange process. Have been wearing the boots every day since delivery! I'm in MN and the cold weather means nothing to my feet while in these boots. I have lots of feet problems and need good support for walking. Out of the box these boots are excellent, in fit and support. I got my size and that fits perfectly, they are very comfortable for walking. If you are looking for traction and grip for those slippery conditions this has grip like I have never seen. My concern was not so much with warmth but was looking for good traction. These boots fit nicely around the calf (I have average size calfs). It works well if you wear your jeans outside of the boots. I bought 7 pairs of boots to find a good fitting, warm, waterproof winter boot. This was the winner. I have high arches, high instep, and long toes. These are easy to get in and off with a zipper, have a great tread so I won't slip, and I trust that the tags that say Keen Warm and Keen Dry mean my feet will be warm and dry. These are true to size. I wear 8 1/2 M. I can wiggle my toes, my heel doesn't slip, overall snug but not too tight. These boots are very comfortable, look good and keep my feet warm! I couldn't ask for a better winter boot in Maine.The boots have zippers on the inside,there light weight,the bottom of the boot have a nice sole for good traction and my feet stay warm as toast! If they get a little muddy-just throw them into the washing machine. Love Keen products, these are great boots. comfortable easy on and off. Can't wait for the snow. I usually love Keen products and buy them for work as I did these boots. I couldn't even wear them for one season because the zipper on the inside of my right boot rubs on the inside of my ankle bone so bad that it makes my ankle bone and skin very sore. It may be a fluke since my left boot doesn't do that and others have not mentioned it, but can't return a boot already worn for a refund and you don't find these things out until they are worn. Wow, these are stiff boots! I wear an 8.5 and have (sort of) high arches, and I was unable to get my foot into the 8.5 boot. They feel very plasticy and cheap. I ended up buying the Columbia Minx boot instead in size 9: same sort of boot but way more lux and comfy.